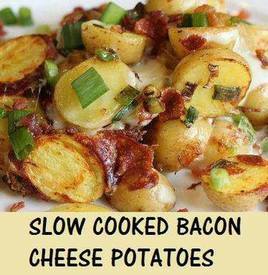 Slow cooked bacon cheese potatoes! No real explanation needed here. It's starting to get too hot to use the oven, (although these can be made with the oven) I wanted to make some good Bacon potatoes in the slow cooker! I usually wait on the cheese and put it on after serving with sour cream and chives! But, to each his own!